One of the things I like about reviewing books is finding new authors that are up to the "repeat performance" test. Nothing is more disappointing than reading a book that you thought was great, and then the next book is a let down. On the flip side, nothing is more enjoyable than having that second book live up to, and sometimes even surpass the first one. 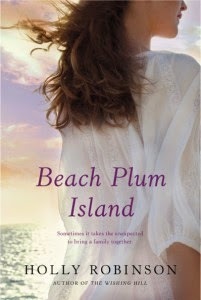 Such is the case with Beach Plum Island the new book by author Holly Robinson. For those of you who read my recent review of her first book, The Wishing Hill, you will know how excited I was to find an author in the women's fiction category that writes with compelling story lines and wonderful, complex female characters.